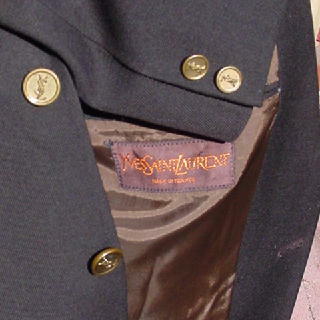 This vintage dark brown jacket was made in France by Yves Saint Laurent. It has a light chocolate brown lining with Yves Saint Laurent lightly printed all over the lining. There are three interior pockets. It has a two button front closure and two buttons on each long sleeve. 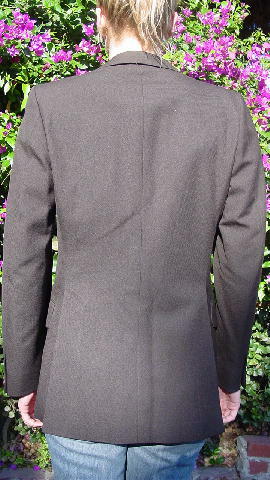 There are two lower front flap pockets and one breast pocket. The brass-tone buttons all have an elevated interlocking YSL logo in the center. The back has a 15" wide by 10 1/4" high vent flap. 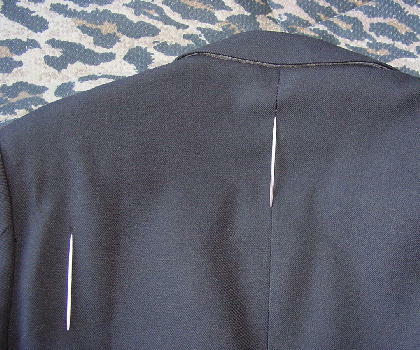 There is a thread pull on the left side of the back, and a few of the center seam threads are showing on the back just below the neckline. It's from a New York model. shoulder pad to shoulder pad 16 1/2"
shoulder to end of sleeve 24 1/4"
shoulder pad to end of sleeve 24"
shoulder to bottom side seam 27 3/4"